With its patent-pending design, Thundershirt’s gentle, constant pressure has a dramatic calming effect for most dogs if they are anxious, fearful or over-excited. This has obvious benefits for most types of anxiety. Thundershirt is also a very useful tool for managing excitability or hyperactivity with strangers, on the leash, or in a training environment. Thundershirt’s calming effect helps a dog to focus (or refocus) her energies in a more constructive direction, allowing training to be more effective. Based on surveys completed by over two thousand customers, over 80% of dogs show significant improvement in symptoms when using the Thundershirt. The Thundershirt is already helping tens of thousands of dogs around the world, and is recommended by thousands of veterinarians and dog trainers. 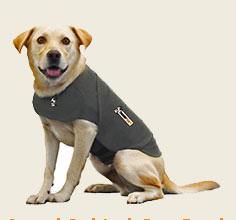 Thundershirts are available through Dr. Fisher’s Holistic Natural Pet Store.